Let’s face it. Too much of our time is spent sitting these days, and it’s not always easy to think about doing your stretches after you get home from a loooong day at the office. So why not incorporate some stretching into your work day? 1. 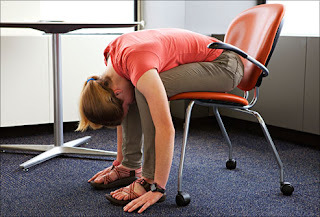 Neck side stretch: hold on to your chair with one hand and lean your head away from that hand. This creates a bit of a traction across the neck and shoulder. For a deeper stretch, gently pull your head with your opposite hand. 2. Neck and back stretch: this one is double duty. First sit up tall, open your chest and stretch your head to the ceiling. Next, round your upper and lower back and look down towards the ground. You should feel this stretch all the way down your spine. 3. 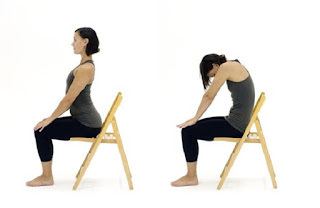 Spine twist stretch (do not do this stretch if your are dealing with any disc issues): Use the arms of your chair or the back of your chair, depending on what you have or what feels comfortable. 4. Folded back stretch: plant your feet on the ground and bend forward over your legs. Relax your head and look down at the ground. 5. Side stretch: hold onto the chair with one hand and lift the other arm up and over your head. Try not to collapse, but instead keep your torso long on both sides. You can also perform this stretch with both arms over your head if you prefer. 6. 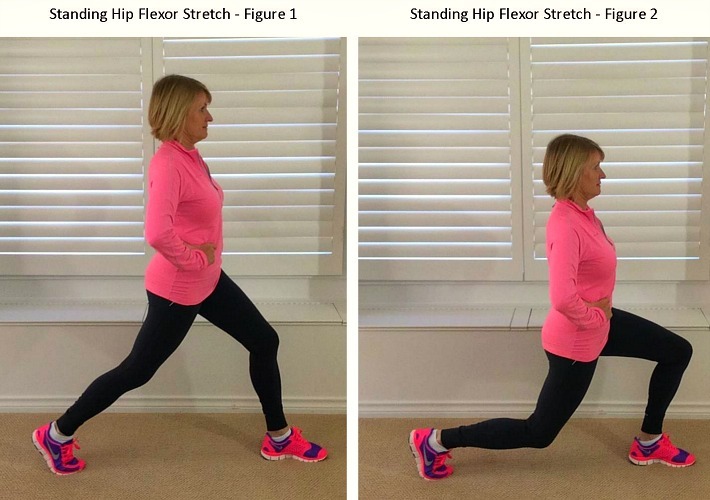 Glute stretch: cross one ankle over the opposite knee. Lean forward slightly to deepen the stretch. This is not necessarily going to be an option if you happen to be wearing a more fitted skirt or dress since your outfit will restrict your movement. 7. Hip flexor stretch: sit on the edge of your chair and keep one foot front and stretch the other leg back. Keep your pelvis tucked under yourself until you find a stretch at the front of the hip of the leg that is stretched back. This stretch can also be done standing if it is comfortable for you. 8. Hamstrings stretch: keep your knee straight and your toes pointing to the ceiling of the leg you are stretching. You might get some stretch in your calf from this position as well! 9. 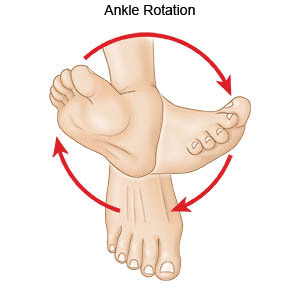 Ankle rotation: pretty self-explanatory. Ankles are often forgotten, but it is good to give them some attention, especially if you are wearing sturdy or heeled shoes.